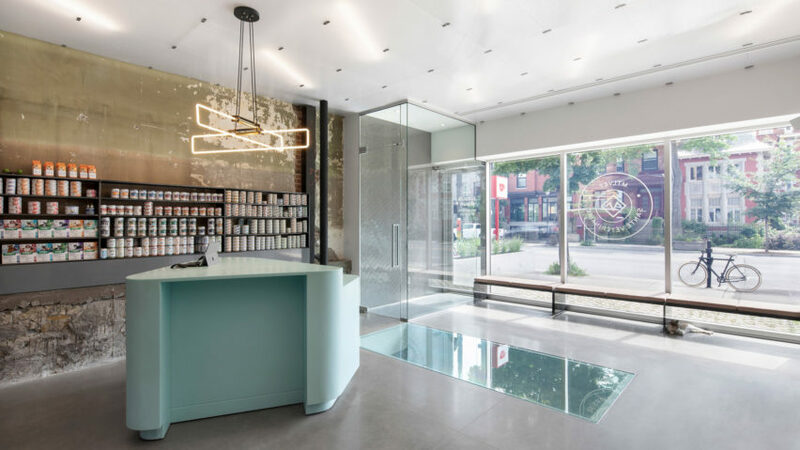 Industrial finishes "resistant to animal wear and tear" are used across this veterinary clinic, which occupies the ground and basement floors of an extended building in Montreal. 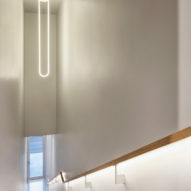 Thomas Balaban Architect (TBA) completed the renovation and extension of a two-storey photography studio, turning it into a four-storey structure that houses four apartments and the Hôpital Vétérinaire du Parc. 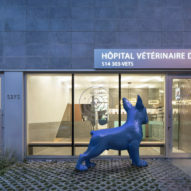 Serving animals of the Canadian city's Mile End neighbourhood, the vets includes state-of-the-art treatment facilities and an SPCA emergency clinic. 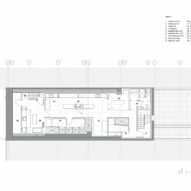 Its interior combines exposed brickwork and concrete surfaces with minimal furniture and equipment, resulting in an aesthetic less typical for a medical practice. 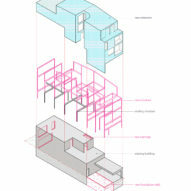 The hardwearing materials were chosen for their practicality and connection to the surrounding architecture, according to TBA. "Stone foundations, concrete wainscoting and ceramic tiling protect the lower part of the walls required to be resistant to animal wear and tear," said a project description from the local studio. In the reception area, patients and their owners are greeted at a sculptural turquoise counter. 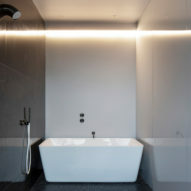 A large rectangular hole in the middle of the floor is fitted with a glass panel, allowing light into the basement space and views up from below. Across the ceiling, milky polycarbonate panels hide mechanical systems and blur diagonal strips of lighting. Towards the back of the building are a series of examination rooms along one side, and a store, pharmacy and more facilities on the other. "Technical spaces are efficiently organised around a central circulation spine, allowing for a spacious reception where animals and owners alike can circulate freely," said TBA. 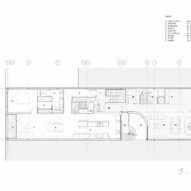 The basement level accommodates areas for grooming, treatments and surgery, as well as spaces for keeping animals overnight. The two levels are connected by staircases at either end of the long, narrow plan. 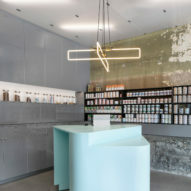 "The dilapidated storefront space and dark basement are brought to life with a calming minimal palette juxtaposed against existing raw surfaces and generous glazed partitions," TBA said. 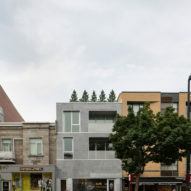 The remainder of the building, constructed using a steel frame behind and on top of the original studio, holds four residential units across three floors. 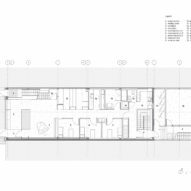 Two apartments laid out across the level directly above the veterinary clinic, and another pair are split across the top two storeys. 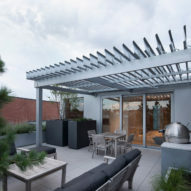 The front unit of these duplexes enjoys a terrace with views to Mount Royal. 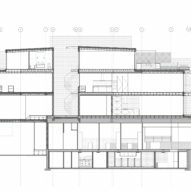 A courtyard in the middle divides the residences vertically, providing circulation space, and more light and ventilation for the deep plans. 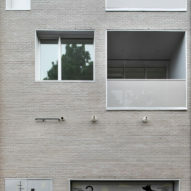 The exterior of the "restrained and monochromatic" building is clad is local limestone, with window and door frames in aluminium. Floor-to-ceiling glass fronts the vets – one of several atypical medical facilities for animals around the world. Other examples include a combined surgery and apartment in Japan, a concrete equine practice in Austria and a timber-clad cat clinic in the UK. Photography is by Adrien Williams unless stated otherwise.